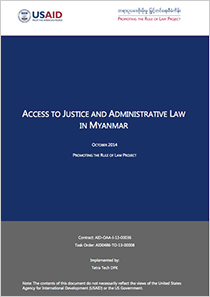 This October 2014 paper by Melissa Crouch (sponsored by the Promoting Rule of Law Project) examines the importance of administrative law in Myanmar in promoting good governance, accountability, and checks on executive power. 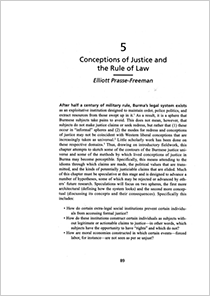 This article by Elliott Prasse-Freeman in Myanmar: The Dynamics of an Evolving Polity (2015) draws on interviews with lawyers and legal aid professionals in Yangon to map the informal mechanisms through which Myanmar people seek out their versions of justice. 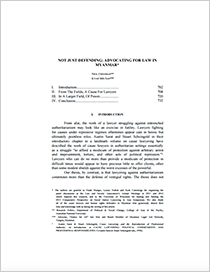 This 2014 article published in the Wisconsin International Law Journal argues that Myanmar lawyers should take up advocacy for the law itself as a cause and a long-term, systemically oriented view of their efforts as activists. In December 2014, the Supreme Court of the Union published a three-year strategic plan for the judiciary. It includes five key performance areas: 1) Protect Public Access; 2) Promote Public Awareness; 3) Enhance Judicial Independence and Accountability; 4) Ensure Equality, Fairness, and Integrity of the Judiciary; and 5) Strengthen Efficiency and Timeliness of Case Processing. Year by year plans and reports on their implementation are available on the Supreme Court’s website.